During a visit in mid-July, I came across a small Northern Map Turtle sunning itself on a sunken log not far from the platform overlooking the pond. 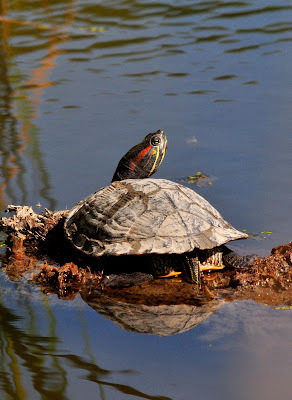 I have seen adult Map Turtles sunning themselves, usually on the far side of the pond, so this was a great opportunity to observe and photograph this one. As a young individual, no more than 9-10 cm in length, it was still brightly marked. This turtle is named for the markings on its shell, which look like contour lines on a topographical map. The head and legs have a pattern of bright yellow lines, with a yellow spot behind the eyes, and the carapace (upper shell) has an obvious raised "keel" or ridge along the centre. 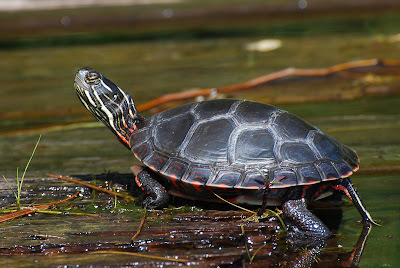 Other similar species found in the park include the native Midland Painted Turtle and, unfortunately, the non-native Red-eared Slider which is the most commonly released "pet store" turtle species in Ontario. They act like the neighbourhood bullies to our native species, often released by owners once they begin growing to 33 cm in length with a lifespan up to 30 years. Their habitat includes large lakes and rivers with slow-moving water and a soft bottom, and they require high-quality water that supports the females' favoured prey, molluscs (females can grow much larger than males, up to 27 cm compared with 13 cm for the males). Female Map Turtles may take more than 10 years to reach maturity, nest from June through July, and lay a single clutch of up to 17 eggs. The incubation temperatures of the eggs determines the gender of the hatchlings. Map Turtles are known for their communal basking, and many individuals can be found piled up together. They have very strong jaws; the females eat snails, clams and crayfish; males and juveniles eat insects and crayfish. Some individuals of this species can live more than 20 years. Water pollution poses a serious threat as it can cause massive die-offs of molluscs, the primary food item of female Map Turtles. Habitat loss and degradation due to shoreline development are additional threats. 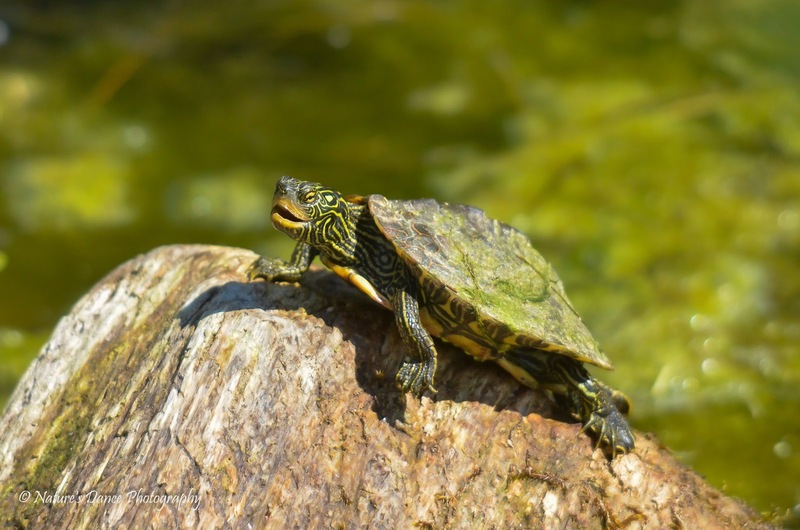 The Northern Map Turtle is listed as a species of Special Concern under the Ontario Endangered Species Act 2007 and the Species at Risk Act. It is also considered a Specially Protected Reptile under the Ontario Fish and Wildlife Conservation Act. Because this species is not very common in our area, and because our reptiles and amphibians are experiencing global declines of 20 and 40 percent respectively, I've always considered it somewhat special. 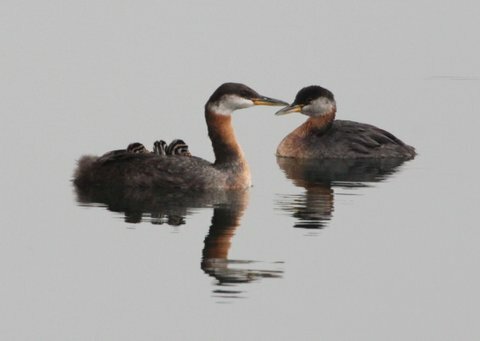 One way to help is to consider becoming a volunteer citizen scientist and submit your sightings, and not just the rare ones. You can do this by downloading the Ontario Reptile and Amphibian Atlas App on your smartphone--it's also a digital pocket guide for all of Ontario's reptiles and amphibians.